This page is aimed at readers who are already reasonably familiar with the terminology and results of general relativity, as applied to our own universe. If you’re interested in quickly learning the basics of that subject, try the Foundations essays on special and general relativity. 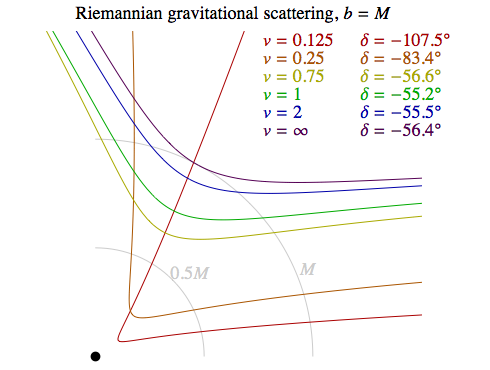 If you just want a summary of the relativistic gravitational phenomena that are different in the Riemannian universe, try the main page on this topic. g is the space-time metric. G is the Einstein tensor, derived from the metric, which quantifies certain aspects of space-time curvature. Λ is the cosmological constant. T is the stress-energy tensor of any matter present (including fields such as the electromagnetic field). We are following common practice in general relativity and using units where not only are time and space measured in the same units as each other, mass is as well, and the units are chosen so that the gravitational constant (which, rather confusingly, is often given the symbol G that is also used for the Einstein tensor) becomes equal to 1. There is no reason that this equation needs to change to be applied in the Riemannian universe. 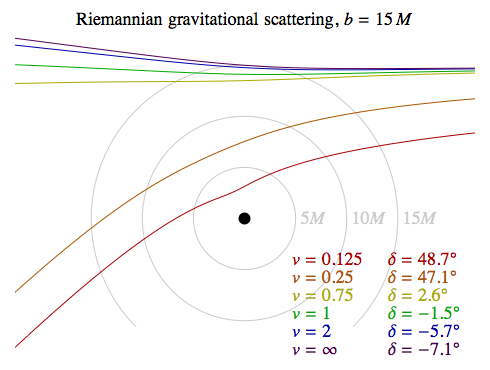 The strength of gravity in relation to other forces might or might not be different in the Riemannian universe, but since we’ve already absorbed the gravitational constant into the choice of units — whatever its value — there’s nothing more to be done about that. The most important feature of Einstein’s equation is that the divergence of Einstein’s tensor is necessarily zero, and the same is true of any constant times the metric. This allows these quantities to be sensibly equated to a constant multiple of the stress-energy tensor, whose divergence must be zero in order for local conservation of energy and momentum to hold. All of this will be equally true, and equally appropriate, in the Riemannian universe. So the only real difference is that we will require solutions of Einstein’s equation in which the metric g has a signature of (++++): that is, solutions for which all dimensions are spacelike. Of course there is one possible change that could be made without disturbing the divergence-free property of the left-hand side of the equation: we could require the gravitational constant to be negative, and so even when its magnitude was set to 1 by the choice of units, the right-hand side of the equation would have a minus sign. But as we’ll see, if we want gravity in the Riemannian universe to behave essentially like Newtonian gravity when objects are moving slowly, keeping a positive gravitational constant turns out to be the correct choice. In many contexts in our own universe the cosmological constant Λ can be taken to be zero, but we’ll keep things as general as possible by including it in our calculations, only setting it to zero to obtain some specific results. So we’ll start our exploration of gravity by presenting the “Schwarzschild-Kottler” metric, which is a generalisation of the Schwarzschild metric to include a cosmological constant. This metric describes the geometry in the vacuum outside a spherically symmetrical body with mass M. For now we will remain uncommitted to any specific value, or even sign, of Λ in the Riemannian universe, but we will assume that |Λ| is small enough that 1+2M/r–Λr2/3 remains positive over the region of interest. The area of a surface of constant r in this metric is simply 4 π r2, but the value of dist(r) is always less than r itself, so these spheres have a greater surface area for their radius than they would have in Euclidean geometry. This is a characteristic of a space with negative curvature. 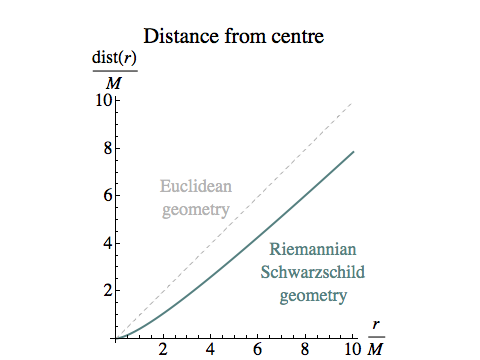 In contrast to this, radial distances in the Lorentzian Schwarzschild metric aren’t even spacelike unless r > 2 M, and then they are always greater than the difference in the r coordinate. We’d like to understand the motion of a small “test particle” in this metric: an orbiting (or infalling) body that is small enough to have a negligible effect on the geometry itself. The general method we follow will be close to Misner, Thorne and Wheeler in their treatment of a body moving in the ordinary Schwarzschild geometry. Because the geometry is spherically symmetrical, we can always choose coordinates so that the world line of the test particle lies in the “equatorial plane” at θ=π/2, and uθ = ∂τ θ = 0. The first term represents centrifugal acceleration, a roughly inverse-cube repulsion for a given amount of angular momentum L. In the Lorentzian version the numerator here is r–3M, so the term changes sign at r=3M, which is why there can be no orbits around a black hole closer than that. But here, centrifugal force stays centrifugal everywhere, and is always stronger than the Lorentzian and Newtonian versions. The second term is just inverse-square gravitational attraction, so we can see that we have the sign of M correct if we want gravity to have the usual Newtonian limit. And the third term is a cosmological-constant-based attraction or repulsion, which can either strengthen or weaken gravity at large scales according to the sign of Λ. For every non-zero value of L the effective potential V has a minimum, where V < –1. So any particle with E > 1 and L≠0 will be in a stable, bound orbit, moving back and forth between the values of r for which ∂τ r = 0, or V(r) = –E2. The dashed red line in the diagram shows an example for E2 = 1.3, L = M.
If E < 1, the particle will not be bound and will escape to infinity, with its closest approach where V(r) = –E2. The dashed blue line in the diagram shows an example for E2 = 0.5, L = 4M. E is the total energy of the particle divided by its rest mass, as measured at infinity in a reference frame in which the central mass is at rest. 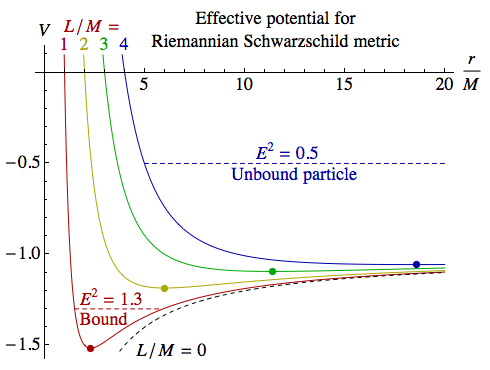 In Lorentzian physics a particle is bound when its energy is less than its rest mass, corresponding to E < 1, but in Riemannian physics the pattern is reversed: a bound particle has a greater energy than a free one. For large R and Λ=0 this gives the Newtonian limit, where the kinetic energy is half the magnitude of the negative gravitational potential energy. In Newtonian physics, as the orbiting body gets closer to the central mass its velocity increases without bound. 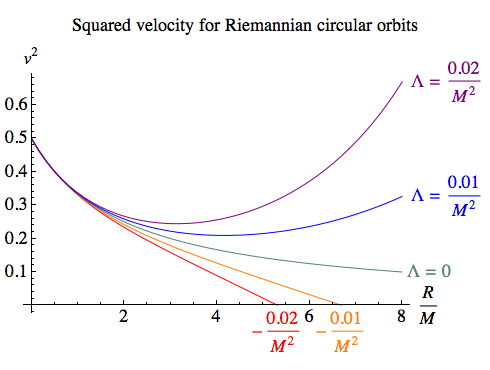 The Riemannian orbits, though, all have v2 approaching 1/2 as R gets smaller. Because centrifugal force is stronger (taking on an inverse-fourth-power character for small r), 1/√2 is the fastest that any object can be travelling in order to be bound in a circular orbit (at least close up). If there is a cosmological constant, there are modifications for sufficiently large orbits. If Λ is positive, gravity becomes stronger on large scales, and after falling to a minimum v2 starts to rise again, without bound. If Λ is negative, the cosmological term adds a repulsion that eventually makes it impossible to gravitationally bind an orbiting body, no matter how slowly it is moving. Suppose our test particle is moving directly towards or away from the central body. Then L = 0, and we can determine the value of the other constant of motion, E2, in terms of the velocity it has at some particular value for r (judged by a motionless observer at the same distance). This matches the Newtonian form of the escape velocity — and makes it clear that there is no distance from which escape is impossible. In the more general case, with Λ≠0, “escape velocity” isn’t really a meaningful notion, because the cosmological term will either be repelling or attracting the particle at large distances. However, regardless of what’s going on at cosmological scales, it remains true that the central mass itself will never be impossible to escape. There are no Riemannian black holes. It follows that someone who takes a detour in space that brings them close to a massive body will experience more time passing overall than someone who avoids the detour. As with other time dilation effects due to motion in flat four-space, gravitational time dilation in the Riemannian universe means more time for the traveller, not less. In Newtonian gravitational physics, a test particle that travels towards a massive body from far away — and is offset sufficiently to avoid a collision — will follow a hyperbolic trajectory that curves towards the central mass. When the particle escapes to infinity again, the direction in which it’s travelling will have changed. We say the particle has been scattered by a certain angle, which we’ll call δ. In Lorentzian gravitation similar trajectories are the norm, but in the extreme case of a black hole the particle can swing around the hole several times before escaping or being captured. In Riemannian gravitation there’s no such thing as a black hole, but when the encounter involves massive, compact objects or fast-moving particles there is deflection away from the body, rather than towards it. The plots on the right show trajectories for test particles with a variety of initial velocities, v, and two values for the impact parameter, b, which is defined as the sideways displacement of the trajectory from a head-on collision (as measured when the particle is at infinity). The red and orange curves in the top diagram — for reasonably slow-moving particles that don’t get too close to the massive body — resemble Newtonian hyperbolas, and the yellow curve on the same diagram only deviates slightly from its original direction, but all the other trajectories are deflected away from the central mass. What flings these particles away is a non-Newtonian centrifugal force. As we saw with equation (2), for small values of r the centrifugal acceleration for a given angular momentum L will be roughly proportional to the inverse-fourth-power of r, as opposed to the inverse-cube in Newtonian physics. If Λ=0, then Rtt > 0, so the volume enclosed by a bundle of geodesics lined up in the t direction will shrink. In other words, gravity will be attractive for clusters of test particles starting out at rest with respect to the dust cloud, bringing them together. Rxx etc. will be negative, though, so clusters of test particles moving through the dust cloud with an infinite velocity will become spread out. The trace of the Ricci tensor, also known as the scalar curvature, will be negative. A sufficiently positive value for Λ would make clusters of test particles contract whatever their direction, and yield a positive scalar curvature, while a sufficiently negative value could reverse all those results. If Λ is zero, then the scalar curvature will be negative, as will all the individual Ricci curvatures Raa, so bundles of geodesics aligned in any direction will move apart. If ρ is constant throughout four-space, that would make the Riemannian universe a four-dimensional hyperbolic manifold. A sufficiently positive value for Λ could overcome the effect of ρ and yield positive curvature, while a negative value for Λ would act like an increase in ρ and exacerbate the negative curvature. It appears to be possible to have a Big Bang singularity in Riemannian cosmology. However, unlike the case in Lorentzian physics (where a singularity seems to be unavoidable), it only happens if a certain kind of symmetry is imposed on the matter in the universe. Here ρ(a(t)) is the density of mass-energy as a function of the length scale a(t). Note that the signs of both Λ and k are swapped in the Riemannian version compared to the Lorentzian version. 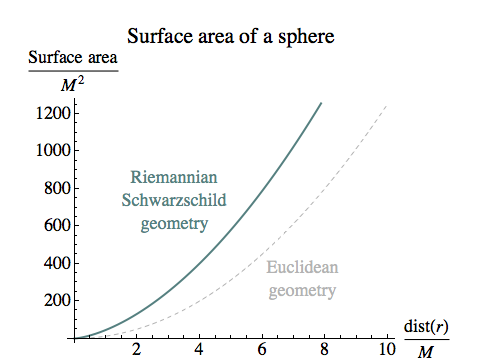 In Lorentzian cosmology, if we set aside the effects of Λ for the moment and assume it’s zero, one of the most famous results is that when the spatial universe is a 3-sphere, it will expand to a maximum size and then re-contract, while if it’s flat or hyperbolic it will continue to expand forever. Because of the swapped sign of k in the Riemannian version of the equation above, all things being equal the opposite will be true: a 3-spherical spatial universe will continue to expand forever, while a flat or hyperbolic one will expand to a maximum size and then re-contract. So for small a, the energy density of radiation dominates. And of course, both components of the energy density go to infinity as a goes to zero. So the energy density of high-entropy matter remains constant! If you think about this, it’s not actually very surprising: this form of matter has no preferred direction at all in four-space, so it’s entirely indifferent to the direction we’ve chosen to call our t coordinate. Now, if there is some low-entropy matter distributed homogeneously throughout the Riemannian universe, with its world lines all pointing orthogonally to the 3-sphere or other hypersurface which (because of its homogeneity) we’re choosing to call “space, at one instant”, then if we follow those world lines back to times when everything is closer together, the density of that matter will go to infinity as surely as the density of the spokes on an idealised bicycle wheel will go to infinity at the idealised hub. But while in the Lorentzian case it’s been shown that this singularity is unavoidable under some fairly reasonable assumptions, in the Riemannian case there are no light cones confining the world lines, so having them all converge towards a single event is a choice, not a requirement — and a fairly artificial choice. Certainly, it’s easy to exhibit homogeneous Riemannian universes with no singularities at all. Suppose we have a homogeneous universe full of matter that is, on a cosmological scale, in a high-entropy, SO(4)-invariant state. This need not preclude any localised entropy gradients and arrows of time, but the orientations of any parallel bundles of world lines throughout the cosmos will be pointing in random directions in four-space. k = –1 for hyperbolic space. What are the possible solutions to equation (6)? (A) 8 π ρ – Λ > 0. For k = 1, a(t) = sinh(K t) / K, slicing into 3-spheres that grow from radius 0, at first linearly in t then exponentially. For k = 0, a(t) = exp(K t), slicing into flat hypersurfaces that grow exponentially with t.
For k = –1, a(t) = (1/2)[exp(K t) + exp(–K t)/K2], slicing into hyperbolic hypersurfaces that grow exponentially with t and –t. (B) 8 π ρ – Λ = 0. For k = 1, a(t) = t, slicing into 3-spheres that grow linearly with t from radius 0 (i.e. t is radial polar coordinate). For k = 0, a(t) = 1, slicing into flat hypersurfaces of constant scale (i.e. t is a Cartesian coordinate). No solutions for k = –1. (C) 8 π ρ – Λ < 0. For k = 1, a(t) = sin(K t) / K, slicing into 3-spheres that grow from radius 0, reach a maximum size then recontract. No solutions for k = 0 or –1. So there are three possibilities for the geometry of four-space: hyperbolic, flat or spherical. There are a variety of ways to slice these four-spaces into homogeneous three-dimensional hypersurfaces, but the four-space itself is unaffected by that choice. In those cases where the universe starts from and/or ends with a scale factor of zero, that does not imply a singularity! The energy density ρ remains constant, and the locations where the scale factor goes to zero are just a product of the way we’ve chosen to slice up four-space into hypersurfaces. As we’ve previously discussed, we have reasons to prefer a finite four-space, and nothing here rules that out. In the case of positive curvature, the entire four-space is necessarily finite; this follows from Myers’s theorem. However, some topologies are incompatible with positive curvature; for example, no torus can be given a metric with positive scalar curvature. For zero curvature and negative curvature there are both finite and infinite spaces; for example, both R4 (infinite four-space) and T4 (a four-dimensional torus) can be made uniformly flat. However, there are still some restrictions on the topology. The Cartan–Hadamard theorem implies that a homogeneous, isotropic space with negative curvature cannot have the topology of a 4-sphere. We start by stating that the metric has components gab in our chosen coordinates that are equal to the Kronecker delta (δab = 1 when a=b, 0 when a≠b, which are the components of the flat metric on Euclidean space in Cartesian coordinates), plus some small perturbation hab, which will be a symmetric tensor like the metric itself. In the Lorentzian version, we use ηab, the Minkowksi metric, which has ηtt=–1 and all other components the same as δab. We define a new symmetric tensor, wab, equal to hab minus half the trace of h times the appropriate flat-space metric: δ in the Riemannian case, η in the Lorentzian case. [The usual notation is to put a bar over the original perturbation, h, but that’s hard to do on a web page.] When we raise an index on the tensor hab to take its trace, we use δ or η, rather than the full metric, because we are only interested in quantities to first order in h. Equally, when we manipulate the indices on wab, we use the flat-space metric. The point of these definitions is that in each case the Einstein equation to first order in the perturbation and its derivatives becomes a simple wave equation in the perturbation w, as shown, so long as w also obeys a transverse condition, similar to that we applied to Riemannian vector waves. In the Riemannian case, the “wave equation” is Laplace’s equation, and any non-constant solution with T=0 will be unbounded. The sum of the second derivatives of w must be zero, so if the solution is cyclic in any direction (which yields a second derivative equal to a negative multiple of the original function), it will have to grow exponentially in another (yielding a second derivative equal to a positive multiple of the function). If we impose cyclic boundary conditions, such as requiring the universe to be T4, exponential solutions won’t be able to satisfy the boundary conditions, and the only solutions will take the form w = constant. So, without a cosmological constant, and assuming the kind of boundary conditions we need in order to avoid exponential solutions in electromagnetic waves, there can be no sourceless gravitational waves in the Riemannian universe. What’s more, solutions associated with an oscillating source will decay exponentially with distance from the source; this is for essentially the same reasons that the field around an alternating current falls off exponentially with distance if the frequency of the current exceeds the maximum frequency νmax under T4 boundary conditions — but in this case the maximum frequency is zero! What happens if we have a non-zero cosmological constant? It might seem that this would turn the gravitational wave equation from a tensor version of Laplace’s equation into something more like Helmholtz’s equation — introducing a constant multiple of the wave, like the ωm2 term in the Riemannian Vector Wave Equation, so that if Λ had the right sign then it would allow cyclic solutions up to some maximum frequency. But this turns out not to be the case. The full analysis is complicated, but if the perturbation in the metric is taken relative to the vacuum solution for the specified Λ, then curvature-related (and hence Λ-dependent) terms enter into the equation for the perturbation in several ways, in addition to the obvious presence of Λ in Einstein’s equation itself. Ultimately, they all cancel out, leaving an equation without a constant multiple of the wave. So it looks as if the boundary conditions needed to tame electromagnetic waves completely rule out gravitational waves. Exact Solutions of Einstein’s Field Equations by Hans Stephani, Dietrich Kramer, Malcolm MacCallum, Cornelius Hoenselaers and Eduard Herlt, Cambridge University Press, Cambridge, 2003. Section 15.4. Gravitation by Charles Misner, Kip Thorne and John Wheeler, W.H. Freeman, San Francisco, 1973. Sections 25.2, 25.3. Misner, Thorne and Wheeler, op. cit., Chapter 27. The Large Scale Structure of Space-time, S. W. Hawking and G. F. R. Ellis, Cambridge University Press, Cambridge, 1973. Chapter 10. “On the structure of manifolds with positive scalar curvature”, R. Schoen and S. T. Yau, Manuscripta Mathematica, 1979, Volume 28, Issue 1-3, pp 159-183. Misner, Thorne and Wheeler, op. cit., Chapters 18 and 35.